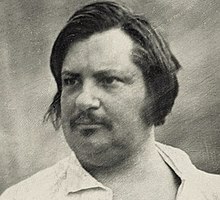 Honoré de Balzac (French: [ɔ.nɔ.ʁe d(ə) bal.zak]; 20 Mey 1799 – 18 August 1850) wis a French novelist an playwricht. The novelle sequence La Comédie humaine, that presents a panorama o post-Napoleonic French life, is generally viewed as his magnum opus. Awin tae his keen observation o detail an unfiltered representation o society, Balzac is regairdit as ane of the foonders o realism in European leeteratur. He is renawned for his multi-faceted chairacters; even his lesser chairacters are complex, morally ambiguous an fully human. Inanimate objects are imbued wi chairacter as wall; the ceety o Paris, a backdrap for muckle o his writin, taks on mony human qualities. His writin influenced mony famous writers, includin the novelists Émile Zola, Charles Dickens, Gustave Flaubert, Jack Kerouac, an Henry James, filmmakkers Akira Kurosawa an Eric Rohmer as weel as important filosofers sic as Friedrich Engels. Mony o Balzac's warks hae been made intae films, an thay conteena tae inspire ither writers. An enthusiastic reader an independent thinker as a bairn, Balzac haed tribble adaptin tae the teachin style o his grammar schuil. His willfu naitur caused tribble ootthrou his life an frustratit his ambeetions tae succeed in the warld o business. Whan he feenished schuil, Balzac wis apprenticed in a law office, but he turned his back on the study o law efter wearyin o its inhumanity an banal routine. Afore an in his career as a writer, he attemptit tae be a publisher, prenter, businessman, creetic, an politeecian; he failed in aw o thir efforts. La Comédie Humaine reflects his real-life difficulties, an includes scenes frae his awn experience. Balzac suffered frae heal problems ootthrou his life, possibly due tae his intense writin schedule. His relationship wi his faimily wis eften strained bi financial an personal drama, an he lost mair nor ane friend ower creetical reviews. In 1850, Balzac mairied Ewelina Hańska, a Pols aristocrat an his langtime love; he dee'd in Paris five months later. ↑ Classe, O. (26 November 2017). "Encyclopedia of Literary Translation Into English: A-L". Taylor & Francis. Retrieved 26 November 2017 – via Google Books. This page wis last eeditit on 5 November 2018, at 18:42.